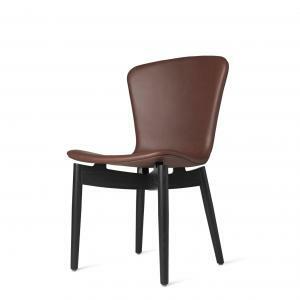 The Mel midcentury modern arm chair with a fine leather seat shell and walnut wood legs is a vibrant design based on the modern 50's era designs. The high grade leather used is full grain leather in organic dyes which shows the natural grain. Thie armchair also has a nice detail using stainless steel parts in a brass finish holding the walnut legs together. This chair is very durable and comfortable so it is great for the home and office. The seat shape and smooth curves lend to the beauty and craftsmanship.